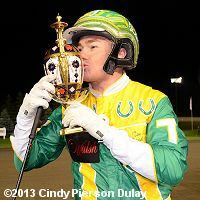 Driver Tim Tetrick kisses the North America Cup trophy. 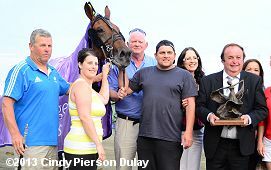 The 30th running of the $1 million Pepsi North America Cup, the world's richest pacing event, was contested on Saturday night at Mohawk Racetrack featuring the best 3-year-old pacing males in North America going the standard 1 mile trip around the 7/8 mile stonedust oval in Campbellville, Ontario. A full field of 10 lined up behind the starter under ideal racing conditions, a clear night with temperatures in the low 70's and minimal wind and a lightning-fast track. 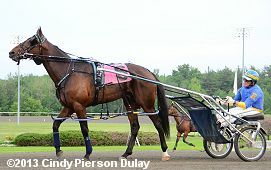 Captaintreacherous was sent off as the 7-5 favorite off wins in the Pennsylcania Sires Stakes at Pocono and then his North America Cup elimination heat. In to challenge him included 3-1 second choice Vegas Vacation, winner of the Somebeachsomewhere Stakes and his elimination. and 4-1 third choice Fool Me Once, also an elimination winner but third in the Somebeachsomewhere. 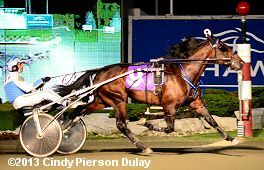 Driver Randy Waples sent 38-1 Captive Audience to the lead first time by and he got the opening quarter in 26 1/5 before Fool Me Once moved up to take over down the backstretch, through a half in 54 seconds and 3/4 in 1:20 2/5, while stalked by Vegas Vacation. Fool Me Once opened up a 1 3/4 length lead at the 1/8 pole but the hot pace set the race up for the closers. 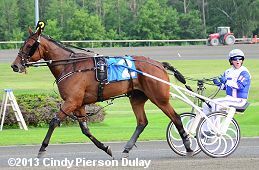 Captaintreacherous, 5th and parked wide early, rallied on the outside to win by 1 1/2 lengths over the 96-1 longest shot Twilight Bonfire, completing the mile in 1:48 3/5 over the fast track. It was another 1/2 length back to late-running 11-2 fourth choice Wake Up Peter third. 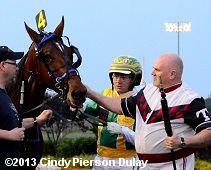 Oddly enough, this was the first time a horse breaking from post 4 has won the North America Cup. Captaintreacherous wins the North America Cup. Results chart Race 7 Left: The winner's circle celebration for Captaintreacherous. 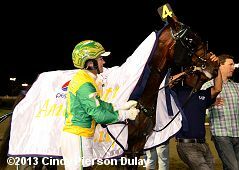 Winning trainer Tony Alagna, celebrating his first Cup win in his first try (he also trains third place finisher Wake Up Peter) said, "I talked to Timmy before the race and said, 'The way that it looks like it's going to unfold out was exactly how the Metro was last year. A couple of horses are going to gun from the outside and they are going to carry you into it.' And that's how the race worked out. It couldn't have worked out any better. Tim worked out a masterful trip, the horse showed up and every time this horse gets a question mark, he comes back and answers it with an exclamation mark. He is that kind of horse." 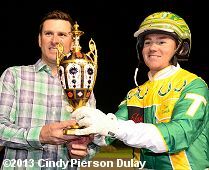 Right: Trainer Tony Alagna and driver Tim Tetrick with the North America Cup trophy. Left: Captaintreacherous in the post parade. 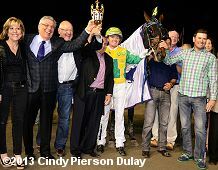 Winning driver Tim Tetrick, celebrating his first North America Cup win said, "He's such a good horse. At times he doesn't always show it but he's always great. Tonight I was second over but we were still three or four (lengths) off the leaders turning for home. And they were pacing strong. I had a lot of confidence in my colt and when I called on him, he did his job. They have to want to do it. They have to want to be champions. They want to be able to put a nose out in front. He doesn't always win by much but he gets the job done." Right: Captaintreacherous gets his blanket after the race. Co-owner Marvin Katz said, "It's indescribable. It's profound. It's just hard to put words and articulate this. It's like sitting on top of a mountain and looking at the world. It's just that good. He elevated himself to the pantheon of great horses tonight. This was not easy. This was a great group of horses he defeated and he raced like the champion that he is. He really elevated his stock tonight." Left: Second place finisher and longest shot Twilight Bonfire warms up before the race. Driver David Miller said, "I feel like I won the race. We went off at (over) 90-1 and we managed to get a second. The horse raced tremendous. I was a bit disappointed in him last week, but we were lucky to get in this race with the draw and he proved himself that he belongs." Right: Third place finisher Wake Up Peter warms up earlier in the evening. 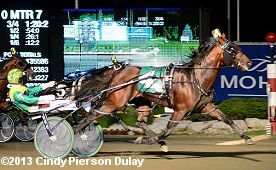 The 11-2 fourth choice was parked wide some 12 lengths off the lead early with regular driver Ron Pierce, but rallied late to get third beaten 2 lengths. 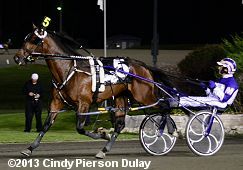 The Tony Alagna trainee improved his record to 2 win, 5 seconds, and 2 thirds in 14 starts, earning $323,900 for owners Wake Up Peter Partners, Brittany Farms, Louis Willinger, and Eagles Soar Partners. Left: The start of the North America Cup. Right: The field rounds the first turn. There were five other stakes races on Saturday night. 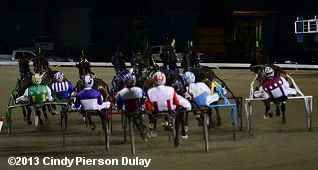 Kicking off the stakes action was the $271,470 Armbro Flight Stakes for trotting older fillies and mares. 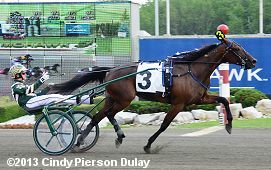 21-1 China Pearls led most of the way through fractions of 27 3/5, 56 1/5, and 1:24 2/5 while stalked by 3-1 second choice Cedar Dove. China Pearls tired badly in midstretch, as 2-5 favorite Maven, fourth early, came through on the outside to win by 2 1/2 lengths in 1:52 4/5. It was another 3/4 length from Cedar Dove to third place finisher and 77-1 shot Bax of Life third. Left: Maven in the winner's circle with Kathleen Wynne, Premier of Ontario, presenting the trophy. Winning driver Yannick Gingras said, "I got here where I wanted to be early. I didn't want too much traffic. Pierce (driver of Cedar Dove) moved earlier than I expected him to. (Maven) got me to the top of the stretch and I just let her do it her way from there." 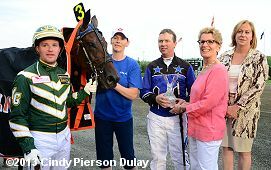 Right: Ontario Premier Kathleen Wynne also presented two certificates to Woodbine President and CEO Nick Eaves honouring the 50th anniversary of Mohawk and the 30th anniversary of the North America Cup. 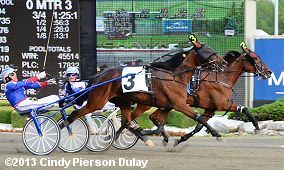 The $364,266 Elegantimage Stakes featured a field of 10 three-year-old trotting fillies. 7-2 second choice Angies Lucky Star was quickest away through an opening quarter in 28 seconds before 3-5 favorite Bee A Magician took over down the backstretch, getting fractions of 56 3/5 and 1:25 1/5. 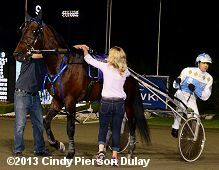 Angies Lucky Star tried to re-rally in deep stretch but Bee A Magician held her off by a head in 1:53. It was a long 2 1/2 lengths back to 46-1 Mistery Woman third. Left: Bee A Magician a magician in the winner's circle. Right: Winning driver Rick Zeron celebrates after the race. Zeron said, "She had to dig in deep and find out where she is really from to get the job done tonight. Sylvain (Filion, driver of Angies Lucky Star) did get by me. I looked over at our wheels and Sylvain's wheel was by me, so I think he had me by a good head. This big filly, 'Nifty' (trainer Richard Norman) had changed her from an open bridle to side cheeks tonight, so I think that was the difference of me finishing second and getting the job done." 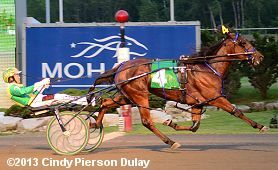 The $391,882 Fan Hanover Stakes is the distaff counterpart to the North America Cup, with a field of ten 3-year-old pacing fillies. 71-1 Jettin Jamie led through the opening quarter in 26 seconds before 3-5 favorite I Luv The Nitelife took over through a half in 54 1/5 and 3/4 in 1:21 4/5. Through the stretch, I Luv The Nitelife left the rest of the field far behind, winning by 5 3/4 lengths over late-running 10-1 Belle Boyd in 1:49 1/5. it was another length back to 4-1 Jerseylicious third. Left: I Luv The Nitelife in the winner's circle. Right: I Luv The Nitelife returns after the race. Trainer Chris Ryder said, "She's just as good as a filly can be. We didn't do anything different with her this week (after she won her elimination). Didn't change anything at all. She's a good horse. It was her fourth start of the year. She did the same last year. In her fourth and fifth starts, she got to be really, really, good. We were relying on that a little bit. You're a lot more confident about it after it happens. I've always thought that I've never had a horse as good as Put On A Show, but I'm going to reserve judgment now." 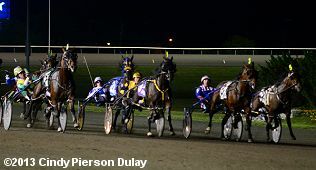 The $225,276 Goodtimes Stakes featured a field of nine 3-year-old trotters. 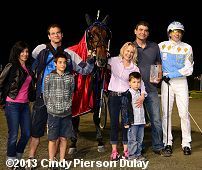 9-1 Flanagan Memory and driver Chris Christoforou Jr. set fractions of 28, 57, and 1:25 2/5 while as many as 1 3/4 lengths in front of 7-10 favorite Toocool Forschool. Entering the stretch, Flanagan Memory opened up a 2 1/2 length advantage. Toocool Forschool attempted to close on the pacesetter but Flanagan Memory held him off by a length to pull off the upset in 1:54 1/5. It was another 3/4 length back to 8-1 Gotta Secret third. Left: Flanagan Memory in the winner's circle. Right: Flanagan Memory returns after the race. Driver Chris Christoforou said, "I never like to have a concrete plan that I'm not going to change from. It never seems to work out well that way. I didn't want to be too far back. I was hoping I could get a second over trip, something like that. I'd take that, but when we left the gate, we weren't going a whole lot and I thought if I could get him to the front and get some fractions, he'd be alright." 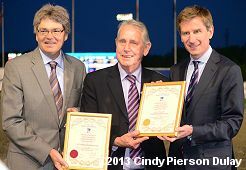 Left: Mayor Gordon Krantz of the Town of Milton (center) presents two certificates honouring the 50th anniversary of Mohawk and the 30th anniversary of the North America Cup to Executive Vice President of Racing for WEG Jamie Martin (left) and Woodbine President and CEO Nick Eaves. 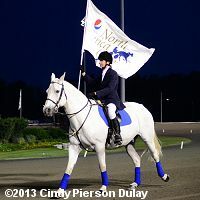 Right: The Pepsi North America Cup flag bearer leads out the post parade.